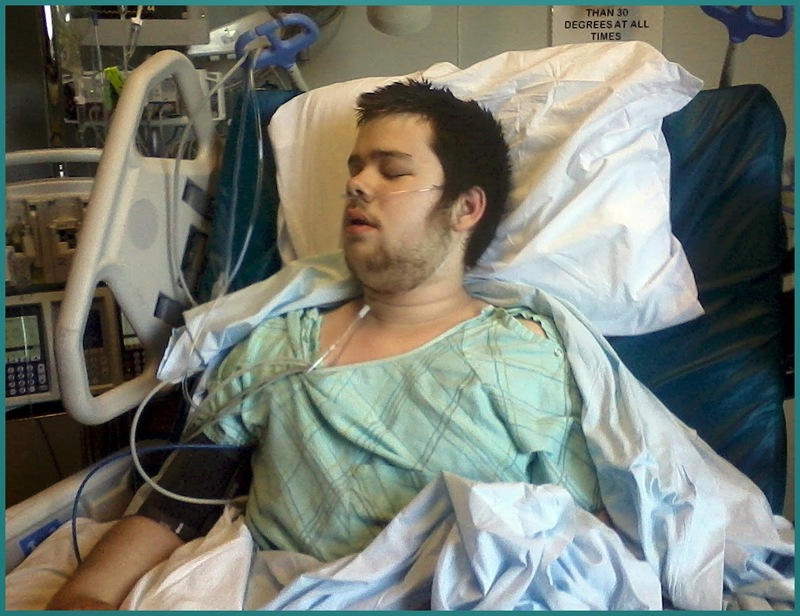 Conor a year ago at the local ICU where he stayed for 6 days while the ICU professionals worked to save his life and return him to us in good health after a serious adverse reaction to his seizure medications. Other parents of children with severe autism disorders and intellectual disabilities should be made aware that their children are at very substantial risk of seizure activity particularly with the onset of adolescence. We didn't know these well established relationships with any certainty until our son started experiencing them. April 2 will be another World Autism Awareness Day in which the harsh realities that many with autism disorders live with will once again be hidden from public sight. Everyone will wear their blue shirts (including Conor and me) and many will put blue lights in front of their homes, businesses and legislatures. The Autism Feel Good crowd will tell everyone that autism is a difference not a disability and some will tell the world that historical geniuses in every field in the sciences, math, literature, art from Van Gogh to Einstein were probably autistic. A misconception underlying much of the WAAD false awareness is found in the DSM assertion that there is one autism disorder with only 2 diagnostic criteria: Social communication/social interaction deficits and Restricted, repetitive patterns of behavior, interests, or activities. The DSM does also reference various "comorbid" conditions sometimes found in connection with autism including several from which my now 18 year old son has suffered along with his severe autism disorder: wandering, self injurious behavior, reactive aggression, absence seizures and tonic clonic seizures. The DSM categorization of disorders, as none other than NIMH Director Dr Tom Insel has pointed out, have no solid evidence basis for its conceptualizations of disorders. TheyDSM categories lack validity. So said Dr Tom Insel before he repeated it again (sort of) but stated that he only meant it for research not clinical purposes. I am not an autism expert. I am the father, as I have stated, of an 18 year old son with autism, intellectual disability and seizure activities becoming most pronounced during his teen years when absence seizures became frequent and eventually became identified with grand mal or tonic clonic seizures. As I have confessed, this pseudo tough guy was scared stiff to hear the sounds emitted by my son's body during the onset of his first tonic clonic seizure, to find him laying on his side his body jerking violently with drool oozing out of the cornier of his mouth. He suffered two such seizures and a life threatening adverse reaction to his first seizure medication (Rhabdomyolysis) which landed him in the ICU (Intensive Care Unit) of the local hospital where the ICU team saved his life and gave him back to us. My son's condition is recognized in many autism study statistics. The World Health Organization, 2013, estimates that approximately 50% of persons with autism disorders also have an intellectual disability. To me that large a number is not a "coincidence" or a "comorbidity" whatever that term is meant to signify in the real world. To me my son's autism and intellectual disability are aspects of one brain disorder. Given those two aspects of my son's brain disorder it should not have come as a surprise to me that he might be at very substantial risk of suffering seizures, particularly with the onset of his teen years. The scientific literature indicates that persons with autism spectrum disorders have a much higher rate of epilepsy than the general population; as high as 30%. The literature also indicates that, among persons with autism. the rate of those who also have epileptic seizures is substantially higher among those with .... intellectual disability and the seizures often become apparent during the teen years ... exactly what happened to my son with severe autism and intellectual disability. My son's autism is not the autism of Temple Grandin, Michelle Dawson or Ari Ne'eman. He was diagnosed early 16 years ago at age 2 years because of the severity of his diagnostic symptoms and the tenaciousness of his mother who pressed our good doctors the hardest for a medical understanding of our son's condition. Still with the autism and ID we did not anticipate the onset of seizure activities. This humble father recommends strongly that on World Autism Awareness Day, Autism Speaks and other autism organizations should be honest with people around the world and tell them that where autism is present in a child there is a substantial risk of epileptic seizures. I also humbly recommend that the great autism thinkers of our day should consider looking at and studying instances of combined Intellectual Disability, Autism and Epilepsy as one group of conditions that might have a common origin in the brain as I believe to be true based on living with my son for 18 years. IDEA Disorder, Intellectual Disability-Epilepsy-Autism Disorder. By all means reject it if you believe based on study and evidence that it is unsound but don't reject it solely because a lowly parent makes the suggestion. I have 18 years of 24/7 experience living with these conditions in my son. Statistics and professional expertise obviously count and in our society are determinative but the direct observation and experience of parents should not be ignored or ridiculed as it is all too often. "At present there is no government monitoring system in place to provide us with accurate statistics on the prevalence of ASDs in Canada"
The recent USA CDC reports that US autism rates are now estimated at 1 in 68 highlights, yet again, the lack of a Real National Autism Strategy in Canada. One of the few specific commitments made by the federal government over the years was a commitment to conducting a national surveillance program of Canadians with autism disorders. As the above quote from the Autism Society Canada web site makes clear that has not happened. 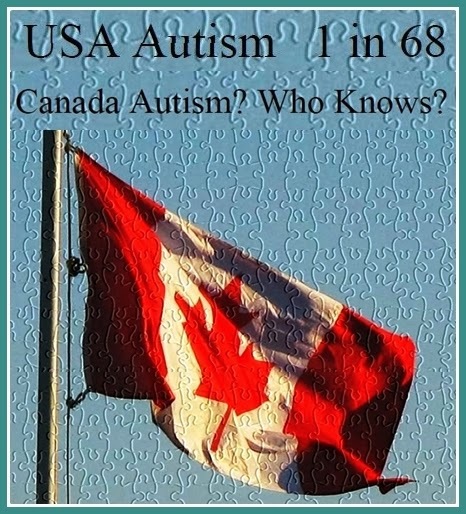 Canadians must simply assume that US autism rates, now 1 in 68, also apply here in Canada. Some good news for those interested in autism issues emerged last night at the Boyce Farmers' Market in Fredericton New Brunswick as Frederictonian's gathered to pay tribute to MP Andy Scott's 10 years of service as an MP on behalf of Frederictonians and as an advocate for human rights, services for the disabled, and cultural harmony. Andy announced that he would be meeting with Paul Martin in the hopes of pursuing a national Autism strategy. Although health care is primarily within provincial juridiction some health issues, such as breast cancer, HIV, etc. have been approached on a national level because of the magnitude of the issues involved. While we have all heard political promises in the past, Andy Scott has a proven track record of commitment to, and follow through on, disabilities and human rights issues. Great news. Family Autism Centre for Education (FACE)"
"But it's very expensive, and there's not a lot of stuff being added to Medicare, generally - that's why we have catastrophic drug problems and other things," he said. "In the province of New Brunswick, P.E.I., or even Quebec or Ontario it's very, very expensive. The feds are going to have to step up to the plate." Andy did answer the call on behalf of autistic Canadians and actively pushed for a National Autism Strategy which he ultimately realized with the passage of Motion M-172. However, the motion was essentially a commitment in principle with few obligations being undertaken by our federal government but it did help put autism on our national agenda and it was Andy Scott being Andy ... getting done what could get done ... with a view to moving forward further in future. One of the specific items that the federal government did commit to in the motion was a national surveillance program, a program that would tell us how many Canadians now suffer from autism disorders. It is a commitment that has still not been honored 8 years later. Mr. Speaker, it is regrettable that we have seen little action by the government toward implementing a national autism strategy. It has been more than a year since I introduced Motion No. 172. My private member's motion called for evidence based standards, innovative funding arrangements for diagnosis, treatment and research, and a national surveillance program. The motion was adopted in good faith and supported by the government. However, it was very disappointing to see no reference to a national autism strategy in the recent budget or any discussion this spring. Recently, I joined my colleagues from Charlottetown and Sackville—Eastern Shore and Senator Munson at a rally in Halifax that reinforced that there are families with autistic children across Canada who need the government's help. The Conservatives should move off their default position of jurisdictional excuses, show creativity and compassion and start helping these Canadians." Andy Scott's reference to his colleagues from Charlottetown and Sackville-Eastern Shore were references to PEI's Shawn Murphy and Nova Scotia's Peter Stoffer both of whom, along with Andy Scott and Senator Jim Munson, also worked tirelessly toward achieving a National Autism Strategy. The rally of which he spoke was a Halifax rally organized by Jean Lewis and FEAT-BC who had been raising autism awareness, lobbying politically and fighting for national autism coverage in the Courts for several years and continued to do so with its "Medicare for Autism NOW!" efforts. I attended the FEAT autism really in Halifax and had the privilege of meeting Jean Lewis, several of the BC advocates and tireless Nova Scotia autism advocate Jim Young. Under the BC leadership there have been subsequent national meetings in Oakville and Toronto. Bill C-304 was defeated soundly by a coalition of Harper Conservatives and separatist Blog Quebecois votes in the House of Commons. During debates in the House of Commons Harper conservative MP Mike Lake from Alberta, the autism face of the Harper government, a father of an autistic son, fought against the Murphy bill and helped vote it down to defeat. The hard truth is that there will never be a real National Autism Strategy as long as the Harper government rules in Ottawa. Nor will a REAL NAS emerge from national autism charities that were never part of the struggle for a national autism strategy to begin with and who do not acknowledge the efforts made by parents across Canada who fought hard and long for a National Autism Strategy. National charities dare not speak contrary to federal government policy for fear of risking their charitable status. 1 in 68 Canadians has an autism spectrum disorder. Today is officially Purple Day in Canada. 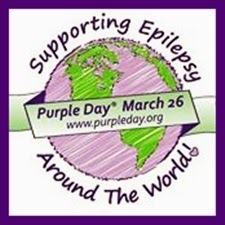 Founded by Cassidy Megan of Nova Scotia, it is a day to wear purple to increase epilepsy awareness in Canada, around the world, and in homes like ours where our son Conor, like many with autism disorder and intellectual disability, also suffers from epileptic seizures. Given the substantially greater numbers of persons with autism, particularly when they also suffer from intellectual disability, awareness should also make that increased prevalence known in the autism community. NOTE: Epilepsy Canada's web site has important facts and information about epilepsy including types of seizures, diagnosis and treatment, and generally how to cope with seizures. This enactment designates the 26th day of March in each and every year as “Purple Day”. 1. This Act may be cited as the Purple Day Act . 2. Throughout Canada, in each and every year, the 26th day of March is to be known as “Purple Day”. 3. On the 26th day of March, people are encouraged to wear the colour purple to indicate their support for people with epilepsy and to increase public awareness of this disorder. 4. For greater certainty, Purple Day is not a legal holiday or a non-juridical day. 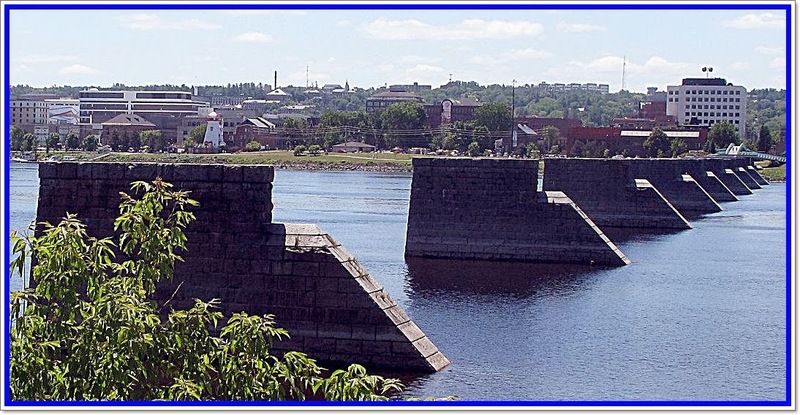 The philosophical, feel good, cliches of the Canadian Association for Community Living and its provincial organizations such as the New Brunswick Association for Community Living paint a pretty picture of a bridge permitting those with severe disabilities to cross over to a wonderful life in the community. The reality is much different, particularly for those with severe autism disorders, intellectual disability, epileptic seizures and other poorly understood conditions. For them there are huge gaps and no bridge at all. Government should be held accountable but so too should organizations like the CACL and the NBACL who provide cover for governments by continually opposing efforts to develop modern, secure, decent, professionally run facilities between the levels of the untrained, unsupervised, inadequate group homes and the psychiatric and medical hospitals where many with severe developmental disabilities are dumped out of sight and mind of all including the CACL and the NBACL. The United Church Observer article, Through the cracks, by Kevin Spurgaitis, tackles issues relating to the lack of available care for adults with severe developmental disabilities including autism disorders. Simply by addressing, and shining a spotlight on the lack of places that can provide permanent residential care to those with autism disorders they have helped to address the hard realities faced by many with severe developmental disorders including severe autism. I was interviewed by telephone by Kevin Spurgatis, who was exceptionally courteous and respectful, qualities which show up in the article itself. I thank Kevin Spurgaitis and the United Church Observer for their effort. It will probably come as no surprise though, to anyone who knows me on a personal level, or knows my views on disabilities and the role played in Canada by the Canadian Association for Community Living and its New Brunswick version the New Brunswick Association for Community Living, that I believe Mr Spurgaitis's article does not address the responsibility of the CACL and provincial divisions like the NBACL for their roles in creating the cracks through which people like my son with severe autism disorder, intellectual disability and seizures fall. The feel good and rigid anti-institution mindsets of these organizations have helped prevent the development of facilities which would provide permanent residency, care by properly trained caregivers and treatment for their serious conditions. The ACL organizations persistently argue against anything that might be labelled an "institution" even if there is no alternative available. In doing so the NBACL has helped push NB'ers with severe autism disorders to lives spent in the Restigouche Psychiatric Hospital, to hospital wards and to facilities out of province such as the Spurwink facility in Maine. This is not speculation on my part. I have participated in several education and adult disability reviews in New Brunswick in which NBACL representatives have fought bitterly against any meaningful attempt to develop the necessary facilities to ensure a quality life for those, like my son who suffer from severe autism, intellectual disability and seizures. As long as the NBACL continues providing feel good cliche coverage to governments for failing to provide a modern residential care and treatment facility to those with severe needs, people like my son will suffer much more limited lives. Here in New Brunswick our government's favorite charity organization, the NBACL, is a major contributor to the problem, they help ensure that people like my son will continue to fall through the cracks. Although my views diverge from the portrait of the CACL and their provincial counterparts as set out by Mr. Spurgaitis and the United Church Observer I do genuinely appreciate the fact that they have raised the issue. As I said I also appreciate, very much, Mr. Spurgaitis' courteous, respectful questioning and his inclusion of severe autism disorder in his article. Early Autism Identification Breakthrough? That's Funny, Conor Was Diagnosed 16 Years Ago At Age 2! Our son Conor recently turned 18. He has an autistic disorder diagnosis. He was originally diagnosed the day after his 2nd birthday. As parents we were concerned about developmental and sensory issues almost 1 year earlier and sought medical advice. At the time neither my wife Heather nor I had heard much about autism but we had observed issues with Conor's development. Conor's brother, 19 months older, had begun speaking at a young age and was engaging in full adult level conversation by age 2. (A retired teacher in Burlington had stopped at our table in Tim Horton's and asked how old he was. When I told her he was 2 she was astonished and said she had taught primary school for almost 50 years and had never seen anything like it.) Conor by contrast had little speech and exhibited different behaviors like pressing his face on the floor of a Burlington mall to feel the coolness, pressing his face against the plastic in the swing set in out living room for extended times, or pointing to a circular metal floor ring around an outlet in the floor tile in the mall and saying "circle" before he ever said mom or dad; and not using many words at all. Shortly after Conor's 1st birthday we were returning to live in New Brunswick where my wife sought medical attention for him. Our family doctor referred us to a pediatrician who conducted tests over a period of several months, including referring Conor for hearing tests to determine whether hearing was or was not a factor. Conor received his autism diagnosis the day after his 2nd birthday ... 16 years ago. Only now are autism researchers confirming that autism diagnoses can be made as early as 1 to 2 years? Our son's diagnosis at age 2 after almost a year of looking for answers (we had never heard much about autism we were just looking for an understanding of our son's condition) proved that possibility 16 years ago. Great to see confirming research but I have to wonder if such research should be hyped as breakthroughs? Maybe autism researchers should not be so dismissive of parents anecdotal information after all? (Medical Xpress)—Many characteristics of Autism Spectrum Disorders can be identified by the age of 2 and are predictive of which children will be diagnosed with these disorders when they're older, a new study suggests. Researchers at the University of Illinois identified a number of behavioral problems and developmental deficits – including many associated with communication and language, social interaction and self-regulation – that if present when children were 2 years old were predictive of their receiving an ASD diagnosis by age 4. "We've found that you can identify autism early – around 2 years old," said lead author Laurie M. Jeans, who conducted the study as a graduate student at Illinois. "Different specialists who work with children with ASD are each focused on specific problems, but this research gathers all those pieces of information together and provides a much bigger picture." Another excellent, thorough discussion from LaTrobe University's Olga Tennison Autism Research Centre (OTARC) focusing this time on early intervention research. Dr Kristelle Hudry, Dr Giacomo Vivanti, Dr John McEachin discuss the development and trends of research into early intervention. Topics covered include the neurodiversity v intervention debate, barriers to research into interventions: historical tendency to prefer high functioning autism, lack of understanding about how children learn, lack of sector accepting evidence of research, general lack of scientific culture, priorities of research funders, the problems of randomised control trials as best practice scientific design." Autism is not a person. Autism is defined by some authorities as a disorder, by others as "autisms" or a varied group of complex heterogeneous disorders and by still other authorities as a group of symptoms which together have come to be referred to as "autism". Autism is not, however, a person and because of that indisputable fact it can not sign petitions lobbying government institutions to abolish legislation passed to fight autism. Autism can not oppose the rights of actual persons to be cured or treated for autism and can not oppose the rights of parents and other legal caregivers to seek treatments and cures for those actual persons with autism for whom they love and for whom they are responsible to provide care for and who actually do provide such love and care along with the best lives they can within their means and abilities. "Stanford researchers have unearthed clues about the formidable brains of some autistic children, suggesting that the diagnosis may signal a different cognitive style, not disability. Superior math skills were found in autistic Bay Area children with average intelligence compared with matched children who were not autistic. The two group's brain scans were different, as well. Images of the autistic children's brains while calculating math problems revealed a different pattern of activity than those of non-autistic children. This small but important study, the first of its type, "makes us better aware of the unique talents that these people have, which could help them have better academic and professional lives," said postdoctoral scholar Teresa Iuculano, lead author of the study. "We think it could be reassuring for parents," she said. The study is being published online Saturday in the journal Biological Psychiatry. Like all people with autism, the children had difficulty with social interactions. But they showed strengths, as well, according to the team of scientists at the Stanford University School of Medicine and Lucile Packard Children's Hospital. "It is not necessarily a deficient brain, but a different brain," said Iuculano." "Autism comes in many forms. It can be a devastating diagnosis with profound retardation. But people can also have exceptional skills or talents, known as "savant" abilities." "Children with autism and average IQs consistently demonstrated superior math skills compared with nonautistic children in the same IQ range, according to a study by researchers at the Stanford University School of Medicine and Lucile Packard Children’s Hospital. There appears to be a unique pattern of brain organization that underlies superior problem-solving abilities in children with autism,” said Vinod Menon, PhD, professor of psychiatry and behavioral sciences and a member of the Child Health Research Institute at Packard Children's. The autistic children’s enhanced math abilities were tied to patterns of activation in a particular area of their brains — an area normally associated with recognizing faces and visual objects. Menon is senior author of the study, published online Aug. 17 in Biological Psychiatry. Postdoctoral scholar Teresa luculano, PhD, is the lead author. Children with autism have difficulty with social interactions, especially interpreting nonverbal cues in face-to-face conversations. They often engage in repetitive behaviors and have a restricted range of interests. But in addition to such deficits, children with autism sometimes exhibit exceptional skills or talents, known as savant abilities. For example, some can instantly recall the day of the week of any calendar date within a particular range of years — for example, that May 21, 1982, was a Friday. And some display superior mathematical skills. " The research team is now gathering data from a larger group of children with autism to learn more about individual differences in their mathematical abilities. Menon emphasized that not all children with autism have superior math abilities, and that understanding the neural basis of variations in problem-solving abilities is an important topic for future research." In Autistic Children Need Help, Not Delays The Toronto Star has spoken out clearly in support of children with autism disorders in Ontario. The Star's message applies in most jurisdictions across Canada. While the Star focuses on Ontario the same logic applies across Canada. Canadians and some conscientious, concerned political leaders including the late Andy Scott from Fredericton, Shawn Murphy from PEI, Glenn Thibeault from Ontario, Peter Stoffer, Nova Scotia, the late Jack Layton and NB Senator Jim Munson spoke out in support of a strong Real National Autism Strategy which, if one had been adopted would have ensured better lives for many children with autism disorders. The fact that these children are missing out rests squarely on the shoulders of Prime Minister Stephen Harper, his "autism dad" front man Mike Lake and their partners in the Bloc Quebecois who opposed meaningful national help for autistic children in Canada. Now that Premier Kathleen Wynne is busy rebranding herself as the crusader for open government, it’s worth noting that accountability also extends to promises that remain unfulfilled. One of the most heartbreaking issues facing many Ontario parents is the government’s failure to help children with autism, especially in the first few years of life when dramatic improvements are possible — with proper treatment. How sad that so much potential is lost, all because young children can’t get specialized therapy when the brain is malleable enough to change. As the Star’s Andrea Gordon reports, four different committees and investigations into the fragmented, confusing and overburdened autism system continue to hear the same concerns, except now the problems are worsening. In order to provide accountability to these families, Wynne must pay attention to their struggles and help parents, many of whom have reached the breaking point. One particularly egregious failing, as the government well knows, is the red tape that forces families to spend months on a waiting list to get a psychological assessment that will decide whether a child will spend years — on another waiting list — for therapy. It’s tragically ridiculous. It can take some four years to get proper therapy, which leaves many parents so desperate they take on massive debts to pay for the only other option, expensive private treatment. Those who can’t raise the cash are left to accept whatever help their children are offered, which often arrives too late. All of these problems were documented in a 2012 Star series on autism, which inspired a promise from the Liberal government for a blue-chip panel of experts to report on improvements to policies and services for people with autism. It was a significant step forward. While the committee’s worthy work is ongoing, it has no control over government funding and since the government has yet to make any dramatic changes, the problems continue. Wynne must find the money to get children off those waiting lists and into proper, long-term treatment. And that’s just the start. The patchwork system should be dismantled and recreated as a new, streamlined service that helps instead of hinders. To be fair, some improvements have been made, such as increased supports for young people transitioning from high school to post-secondary studies. That’s certainly beneficial. And there’s hope that a Queen’s Park all-party committee on development services will make good recommendations, which are expected in May. Its recent interim report poignantly noted the value of proper treatment, as told by the grandmother of two autistic boys: The first, she said, had to wait four years for therapy and by then he “regressed, his behaviours became ingrained and the window of opportunity was missed.” When the second boy was diagnosed, his family immediately sent him to private specialized therapy and he’s now a successful student in a regular school. It’s about potential. Accountable governments should help children with autism achieve it."